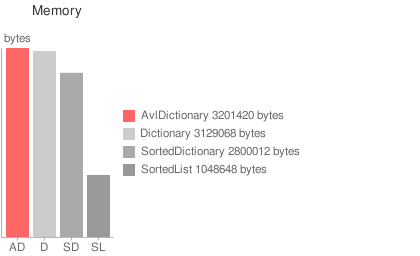 AvlDictionary<TKey,TValue> is an open source C# Avl-Tree based generic IDictionary<TKey,TValue> implementation. In order to use AvlDictionary<TKey,TValue> copy AvlDictionary.cs to your solution and use the AVL-Tree based generic AvlDictionary<TKey,TValue> like you use the hash based generic Dictionary<TKey,TValue>. AvlDictionary.cs - C# implementation of an AVL tree based generic IDictionary interface. This file is part of PBL - The Program Base Library. For the tests I prepared an array of 100000 key-value pairs of type string. The keys were the strings 'k0', 'k1', ... 'k99999' and the values the strings 'v0', 'v1', ... 'v99999'. I used the array for different tests in random, sorted and reversed order. 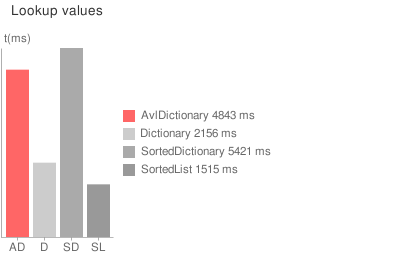 AvlDirectory needs slightly more than Dictionary and SortedDictionary, SortedList needs less memory. 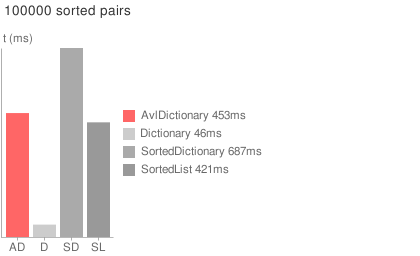 AvlDirectory is slightly better than SortedDictionary, SortedList really needs a long time. 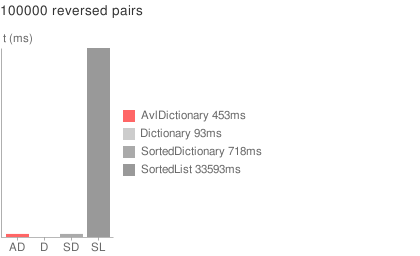 AvlDirectory is slightly better than SortedDictionary and on par with SortedList. 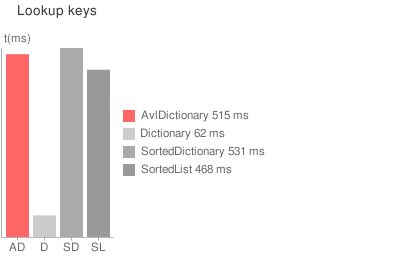 AvlDirectory is significantly better than SortedDictionary, SortedList really needs a long time. 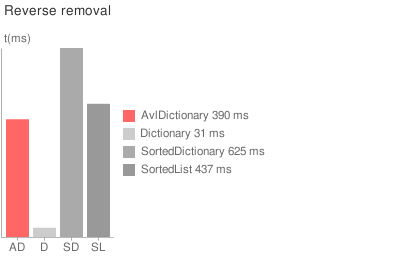 AvlDirectory is better than SortedDictionary and slightly better than SortedList. 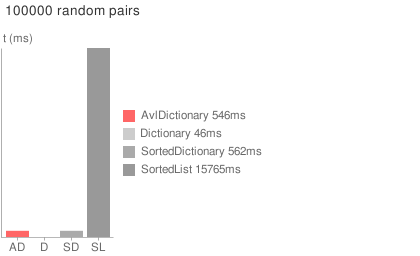 AvlDirectory is better than SortedDictionary and slightly worse than SortedList. For this O(N) operation AvlDirectory is better than SortedDictionary and worse than SortedList. The tests were created by using Program.cs, the raw test output looks like TestResult.txt. Conclusion: I do not understand what the .NET built in type SortedList list is good for at all and I would prefer AvlDirectory over the built in type SortedDictionary. However the built in type Dictionary is either awesome or it cheats with the test outputs :-).